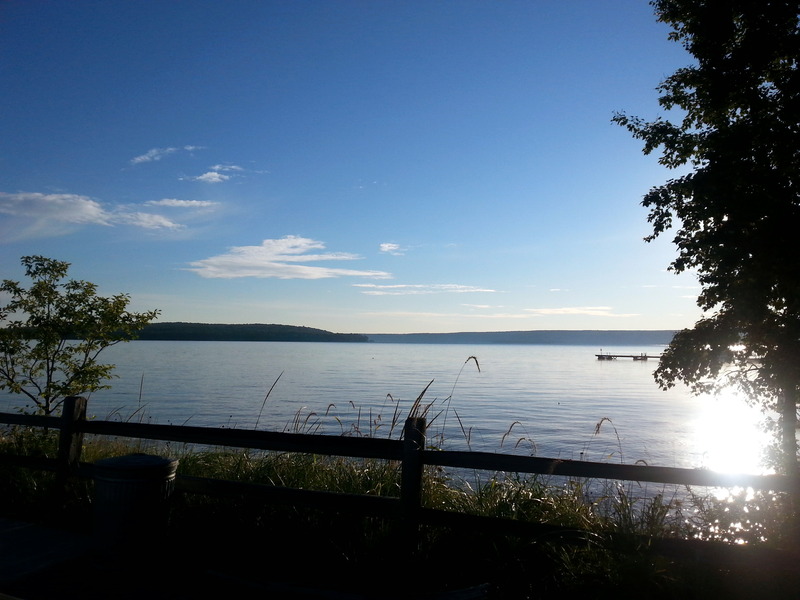 Grand Island lies in Lake Superior, just north of Munising. 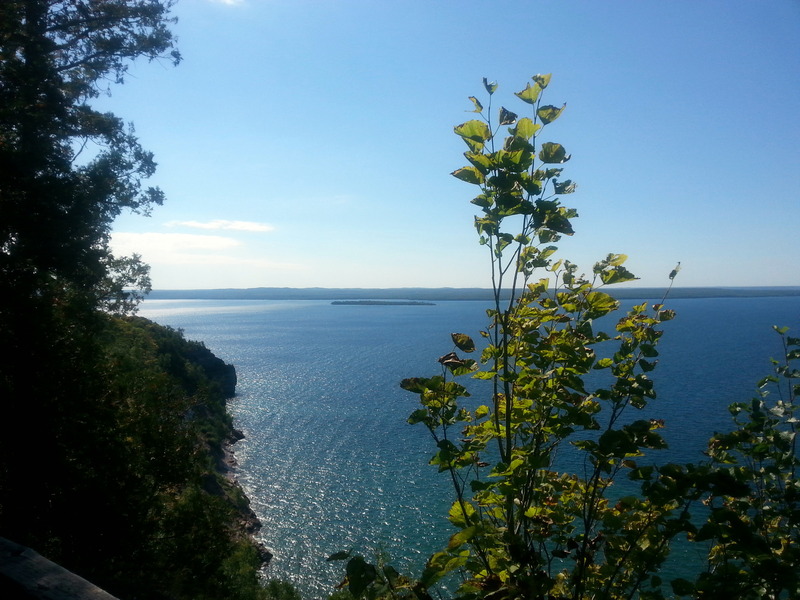 It’s part of the Pictured Rocks National Lakeshore. Part of our grand plan for this trip was to take our mountain bikes to the Island, and ride the miles of roads and trails there. 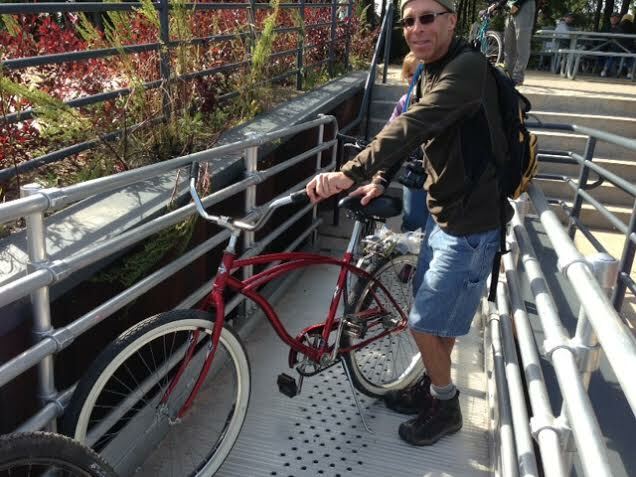 Easy to get there – a $10 passenger fee, plus $5 for each bike got us a seat on the six-person pontoon ferry at 9am. 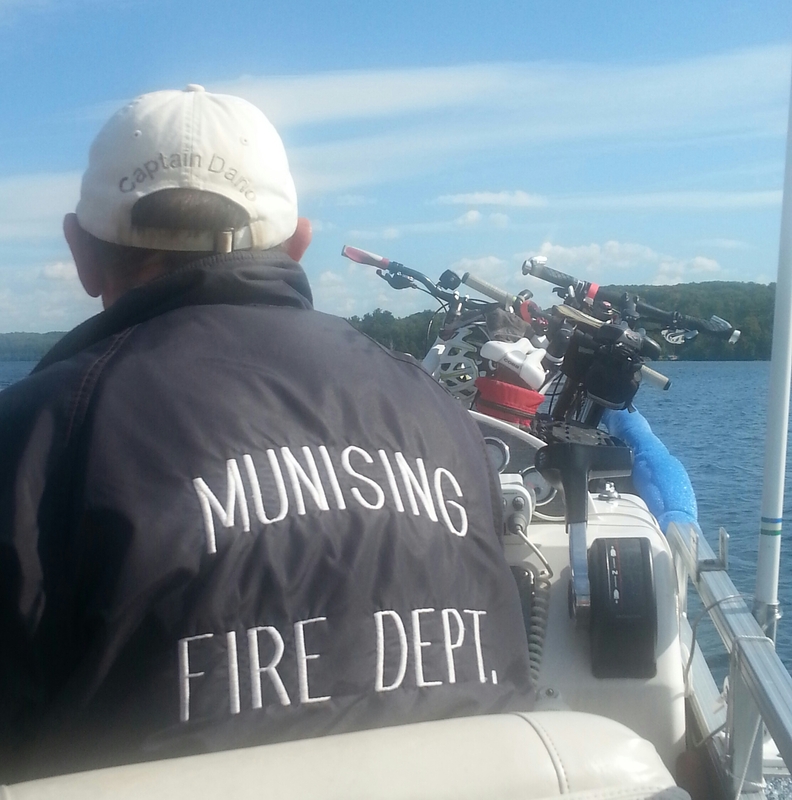 Ten minutes later we were deposited on the shore with the warning that return ferries were at 12:30 and 3:30. Period. Don’t be late. 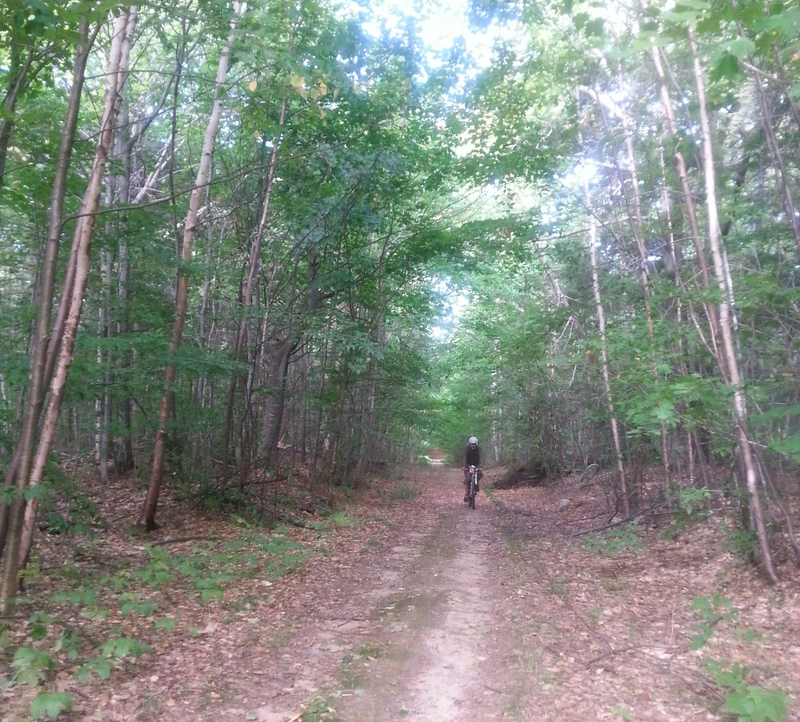 We anticipated a pleasant gravel-road riding day. What could go wrong on “carriage roads”? The two-track road, or trail around the Island perimeter had suffered a lot of damage in the same storm we experienced in Tahquamenon. Some of the “carriage roads” must have been raging torrents of water and debris. There were deep gullies cut into many of the Trails, banked on either side by equally deep pockets of black mud. I would describe my ride this way…..Pleasant – 86%. Worrisome, needs lots of concentration – 10%. The remaining 4% falls into the category of OMG! I’m gonna die! Up and down. Many of the turnouts are right on the shore. Small campsites for hikers dot the Trail. 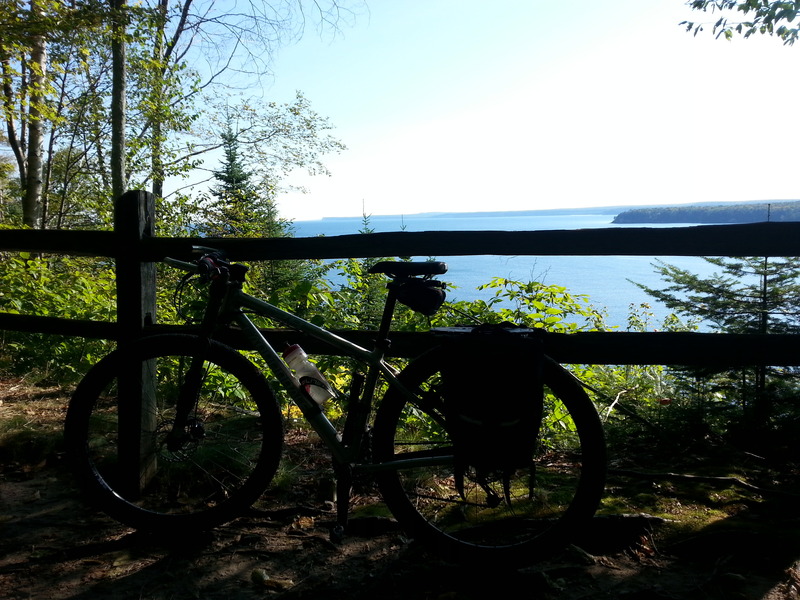 Several sections involved climing up steep, rocky paths with wet sand impeding our tires grip. The deep puddles? We avoided the ones we could, walked around a few, and the others?…..Well, picture me pedaling hard, bogging down in the mud. Eyes bulging. Hoping to be able to rotate the pedals that last turn which would enable me to escape an unpleasant dive into the mud. Ahhhhh – success! At one point, we came to downed tree, totally blocking our path. “Stand back”, announced John. “I’m going to bunny hop this”. By the I picked myself up off the ground laughing, he had already started to lift our bikes over the obstacle. It’s so beautiful. We stopped at every turnout, and even devised a few viewing spots of our own. The hardwoods are just beginning to smudge with color – we would catch a glimpse of yellow birch, and a flash of bright red maple here and there. We found a great spot for lunch. We were starved, having worn off our breakfast oatmeal several miles back. I had packed turkey/swiss/pesto sandwiches, apples, and the last of some hummus and crackers we’ve been savoring on our trip. Imagine my horror when I opened my pannier and found that the hummus contained had opened up and disgorged about a cup of sticky, gooey spread all over everything! The inside of my pannier looked like a diaper horror! If you know me, you’ll understand the brief, unhappy conversation I had with myself about my packing skills. We spent about five hours cycling around. We ran into the Ohio couple we came over on the ferry with several times. Dave was an experienced cyclist who had borrowed his dad’s Walmart, flat-pedal Huffy for the trip to Michigan. He gave that bike the ride of its life, I’m sure. Everytime we saw them, they were all smiles. 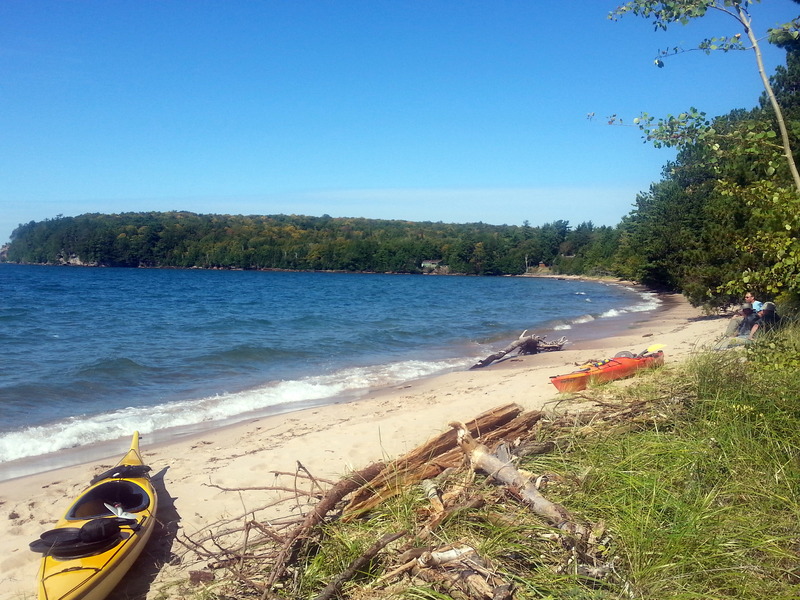 We ran across a few kayakers taking a breather on the west edge of the Island. A waterfall runs right down to the beach. Scenic views abound. 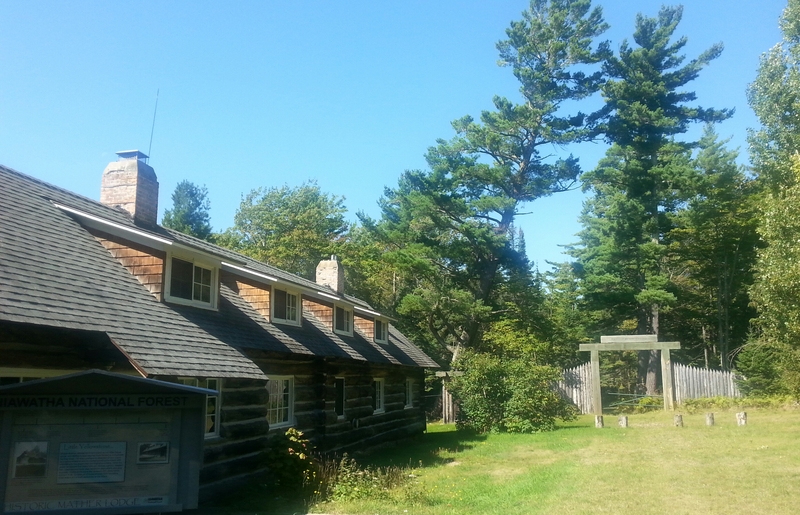 Although a few private residences remain on the Island, most buildings are now owned by the Park Service. 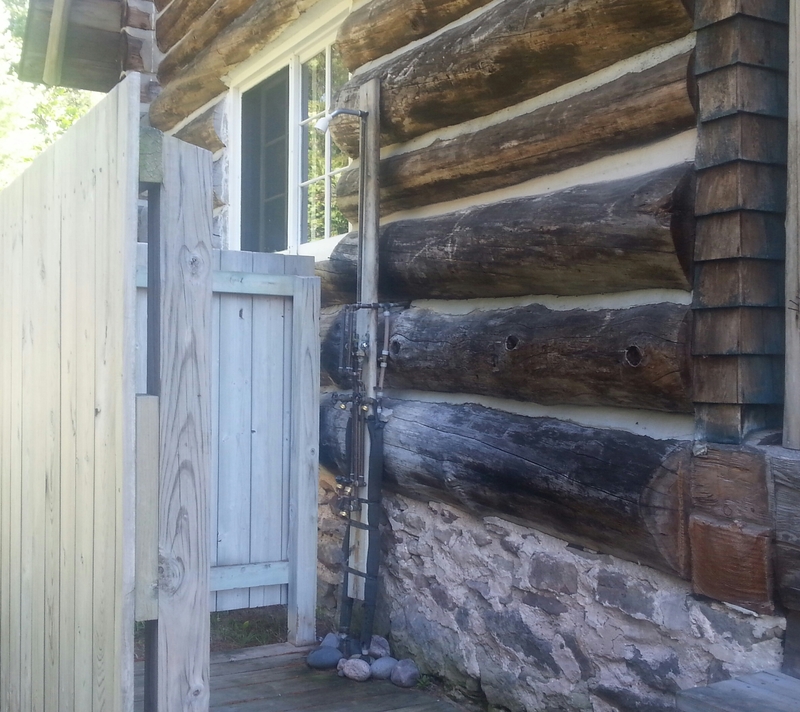 How about this nifty outdoor shower? Lots of the miles were flat and easy. The upshot? If you get the chance – GO! Bikes can be rented on the Island, or you can bring your own. Or, what the heck – take a hike. Just take the time and go. 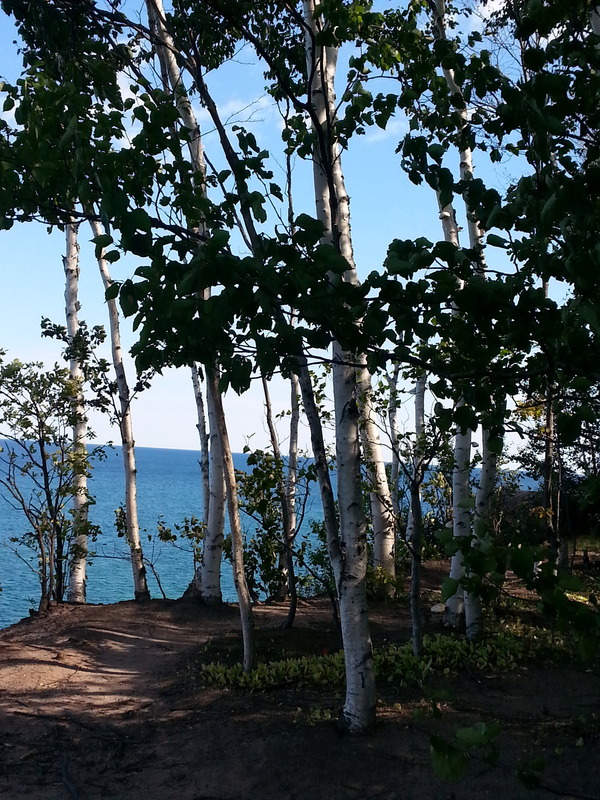 This entry was posted in camping, cycling, Michigan, national parks, retirement, T@DA and tagged cycling, Grand Island, Michigan, national parks, Pictured Rocks National Lakeshore, the great outdoors by Judy Crankshaw. Bookmark the permalink. Sounds lovely…adding it to our to-do list……if and when we get back to the UP. Hope you do get back, Lynne. Sounds like you’ve got other fun plans tho…. Loved your graphic description of the dumped hummus! Hilarious, though I wouldn’t gave been laughing had it happened to me! Your photos totally capture the beauty of the area! You should be glad that you didn’t see the horrified look on my face when I opened that pannier! NOT a happy moment. Ah well……moving on….. There were lots of beautiful picnic spots on the Island. You could certainly enjoy it there without killing yourself on a bike! Thanks Judy for another hilarious script and beautiful pictures! Hilarious???? I’m lookin’ for a bit of sympathy here, Sandi…. Hummus dump and bunny hop…got me for an afternoon smile indeed!!!! Bunny hop is a legit mtn bike term. When the rider jumps over a big log or over a chasm of some sort, it’s a bunny hop. Sadly, neither John nor I can execute one. Happy to provide some entertainment, tho. Thanks, Carla. What a beautiful place! I really need to go there, I’d love it from what I see in your wonderful photos! Can’t wait for you to come up here…. already looking forward to your photos. “Wonderful photos” is high praise. Thanks. If you happen to get into any bookstores in the UP, try to find a copy of “Grand Island Story” by Beatrice H Castle. 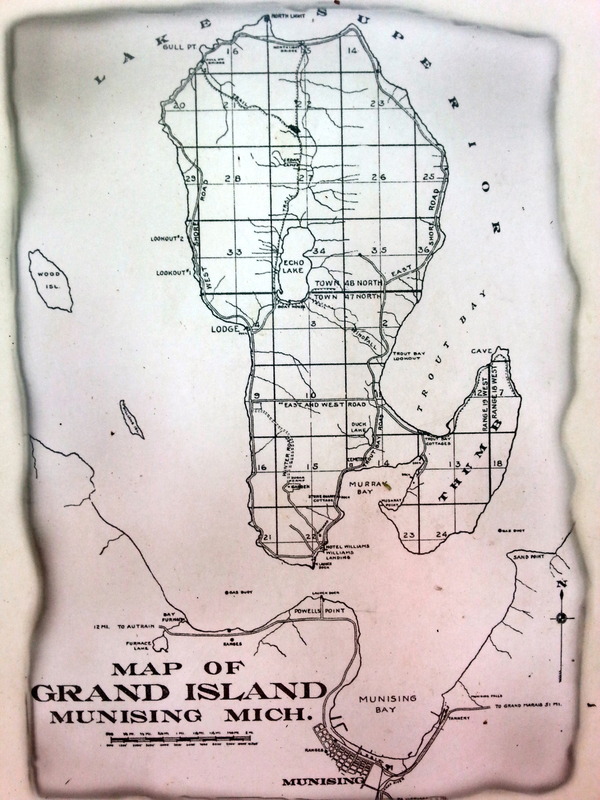 She wrote in 1906 the only history of Grand Island ever compiled when she was a young high school teacher in Marquette. 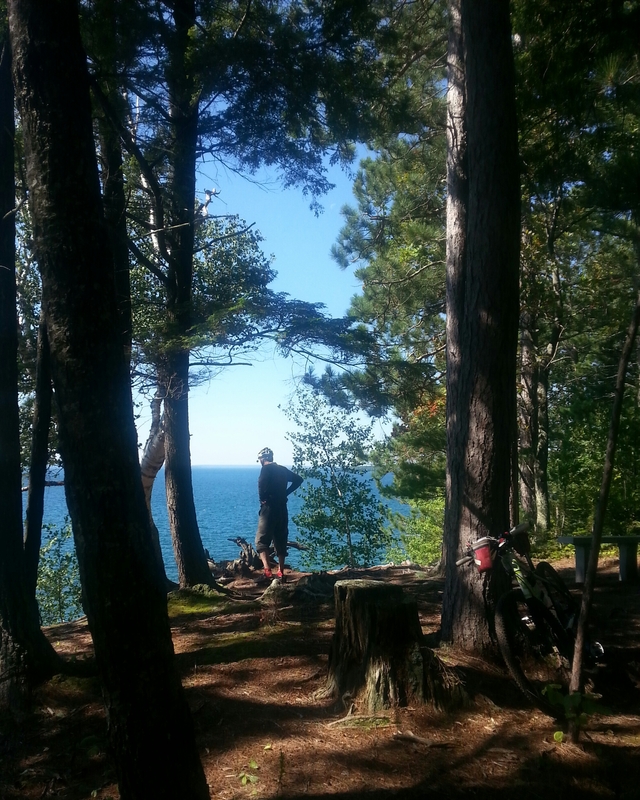 She spent many hours on the island and in the town of Munising talking with pioneers and old Ojibwas. The paperback copy I have has a print date 2005. It’s a great read with pictures too! They have bookstores in the UP? Are they colocated in breweries? Week keep an eye out for this title. Saw books in the MI Visitor Ctr today, but it was before I saw your note. If we get to do our circumnavigation of Lake Superior next year this will have to be on the agenda!!! Great pictures as usual! You will love it Gary. Your boat trip came up several times – are your ears burning? I’d be willing to bet that the pontoon ferry you took across was powered by a nice quiet Honda engine :-) Yoly and I had a good laugh about your description of the diaper disaster ! Two words….Ziplock Bags. Thanks, Neil.